I suspect that you'll soon be hearing a lot about Bee Propolis. Sometimes referred to as bee glue, propolis is a dark, sticky resin that seeps from the buds of some trees and bark. Honeybees blend it with wax flakes secreted from special glands on their abdomens. The word Propolis comes from two Greek words: “pro,” which means before and “polis,” which means city. Bees actually use it to narrow the opening of their “cities” or hives to keep out unwelcome intruders. As a child, whenever I started to feel like I was getting sick my mom would simply give me propolis and raw honey. And looking back, I rarely got sick as a child. In fact, to this day I rarely get sick and I really believe that my regular use of bee pollen and propolis helped build and reinforce my immune system. 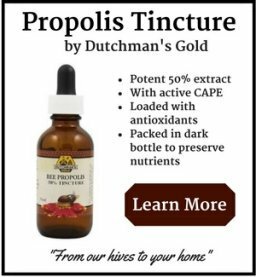 And now whenever I feel like I am “catching” something or if I have come down with a cold, I know that a little bit of propolis 3 times per day does wonders for killing off the virus. That is interesting because propolis is what the bees use to protect the hive from any invaders by reducing the size of the entrance and by covering any holes or unwanted openings from the outside. It keeps the inside of the hive immaculate and the honey clean too. Bee propolis actually has a tremendous number of healing properties and has been used for centuries as a natural remedy. I will warn you – it has a rather odd taste. But it absolutely works! So next time you feel a tickle in your throat, let the ancient wisdom of the bee hive aid you and give propolis a try. 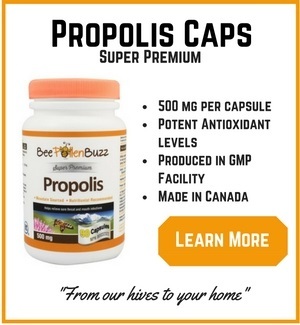 Bee propolis comes primarily in a liquid tincture form and capsules. You can also find it raw chunks which you chew. Don't simply squirt the dark liquid into your mouth though - it has been know to stain the teeth of some, although not all users. Take the dropper and inject the liquid right into the back of your throat. So How Does Propolis Work? Biological activities of propolis are mainly attributed to the phenolic compounds such as flavonoids. Flavonoids have been reported to exhibit a wide range of biological activities, including antibacterial, antiviral, anti-inflammatory, anti-allergic, and vasodilatory actions. A study was done in Germany with 1059 beekeepers to ask them what they use Propolis and other bee products for. They reported, among other things, that they used bee propolis most frequently to treat colds, wounds and burns, sore throats, gum disorders and also as a general prophylactic, while pollen was most commonly used as a general prophylactic and, less frequently, in treating prostate diseases. No adverse experiences were reported. So my mother was right all along. 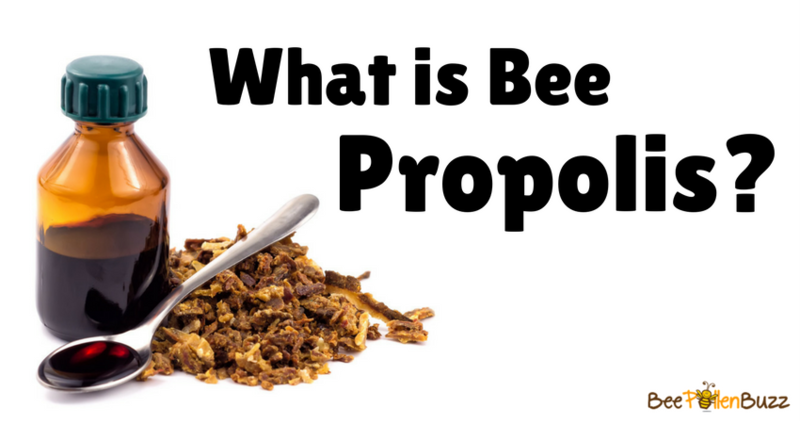 What is Bee Propolis Made Of? Propolis contains many minerals, including magnesium, calcium, phosphorus and potassium, as well as beta carotene, bioflavonoids, vitamins B1 and B2. 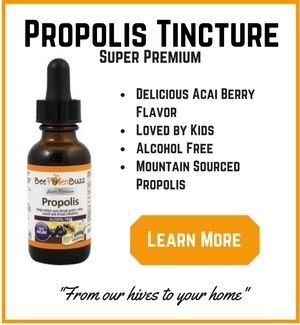 As a concentrated source of bioflavonoids, (it contains more bioflavonoids than oranges) propolis may help strengthen capillary walls and connective tissue, enhance absorption of vitamin C, and play a supportive role in reducing respiratory infections, bleeding gums, varicose veins and many other ailments. 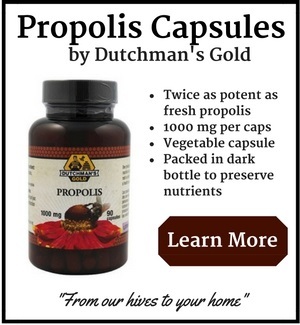 Many who take propolis regularly report fewer colds, flus, infections along with greater stamina and energy. Caffeic Acid (anti-inflammatory, anti-oxidation, anti-cancer, anti-bacterial, anti-viral, anti-fungal, and immunomodulatory effects) This is the superstar compound in propolis that has researchers buzzing with excitement. CAPE is showing powerful activity in dozens of study around the world.